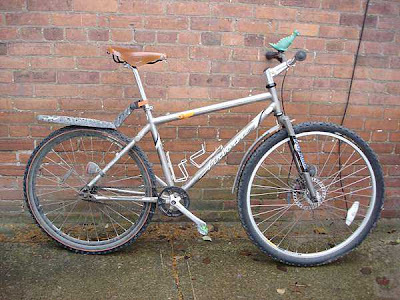 Found a site in the UK called the londonfixiebike shop that has one stop shopping for all your fixie conversion needs. I found this on Backcountry.com's blog The Goat. Obviously, the author doesn't think outside the box and probably thinks there is big money in every Nigerian Scam Note. London Fixed Bike makes a converter that attaches a fixed gear cog to a standard disc brake rotor mount. 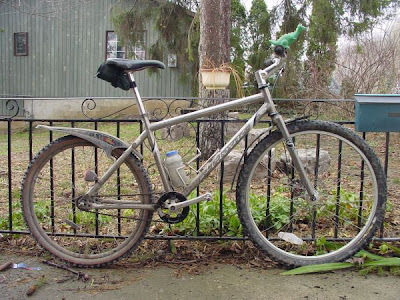 Bike Magic says you can use it to convert a front mountain bike hub into a rear wheel, but you’ll run into some serious spacing and chain line issues unless you also swap out the axel. Of course, the London Fixed Bike setup is flawed from the start because you’d have to be insane to want to ride a fixed gear off road. Downhills would be an absolute killer and I can’t imagine uphills would be much more fun. If you want to turn a mountain bike front hub into a rear to build a road wheel, the setup costs about $60 (plus axel). Check out the responses to the blog post. They are entertaining. Since Boone seems to be off the air, it looks like TomiCog has a little competition, or perhaps it's the other way around. 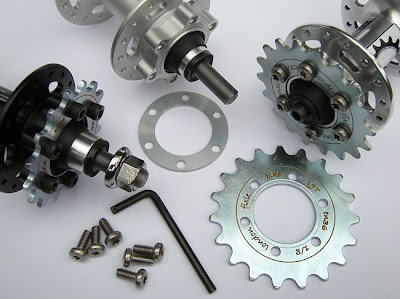 And speaking of conversions, I started chatting with a guy on MTBR who built up his own fixie 69er and he has a really good how-to on converting hubs to fixed gear. Check out Tom Chow's article on the fixed gear gallery (if you haven't already) on how to do this. He's using a TomiCog 19t. I run a 20t but the way I am now, I think I could move down to a 19t or 18t both fixed and single speed. Here is how the bike now looks. 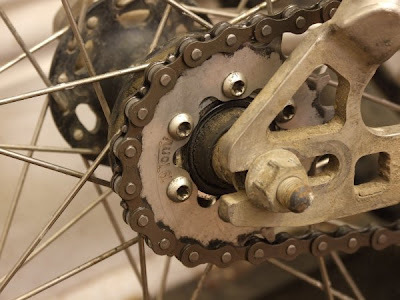 According to Tom, the rear wheel uses a Shimano front hub with the axle replaced with a 10mm rear bolt-on one, and a cog bolted to the ISO disc mount.